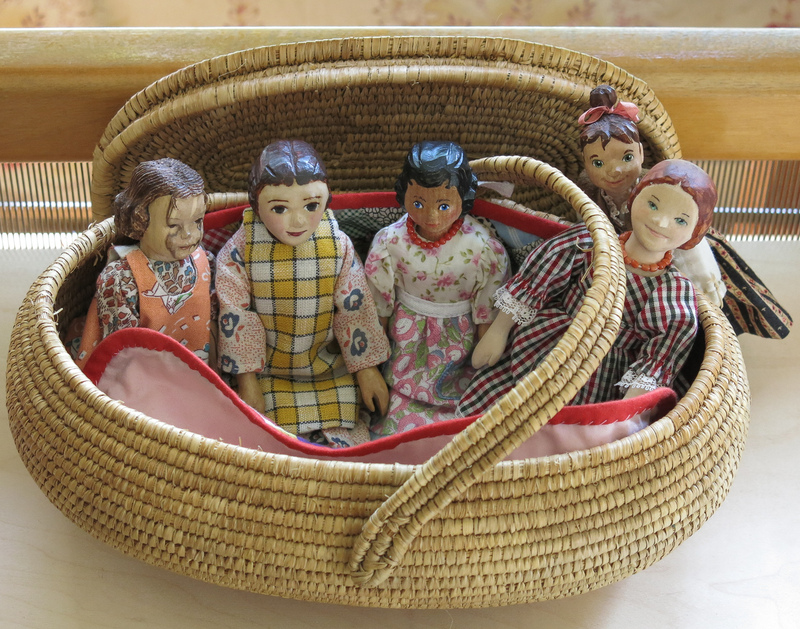 This pretty Basket was recently acquired from a Thrift Store. The Quimper Hitty human is very fond of baskets. The oval shape and snug lid make it perfect for Hittys. Several Quimper Hittys can occupy it, either sitting up or lying down. They find it especially comfortable when lined with a pretty “Postage Stamp” quilt, which was made about 40 years ago by the beloved grandma who introduced the local human to “Hitty – Her First Hundred Years”. 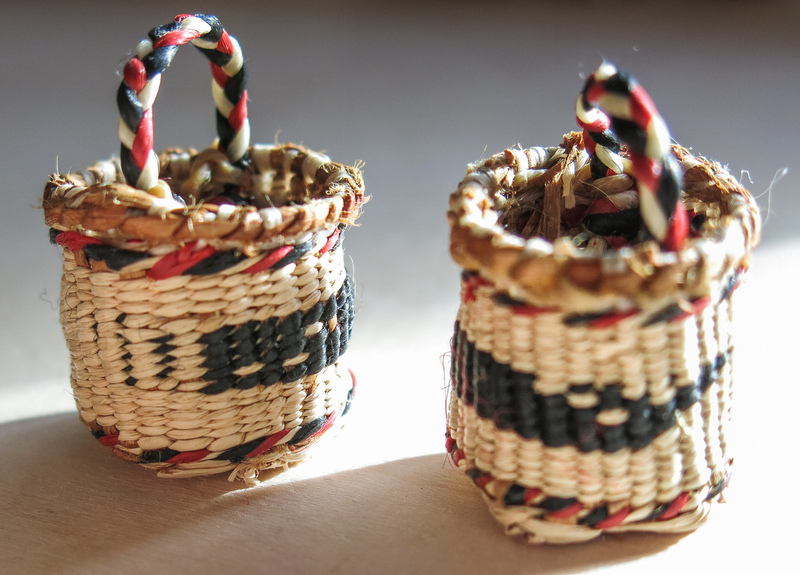 This exquisite pair of baskets was made by an unknown artist from the Makah Tribe. They are beautifully made using the twining technique. The materials used are dyed and undyed grass over cedar bark, and there is a whale design on each one – head visible on the left basket, and tail visible on the right one. 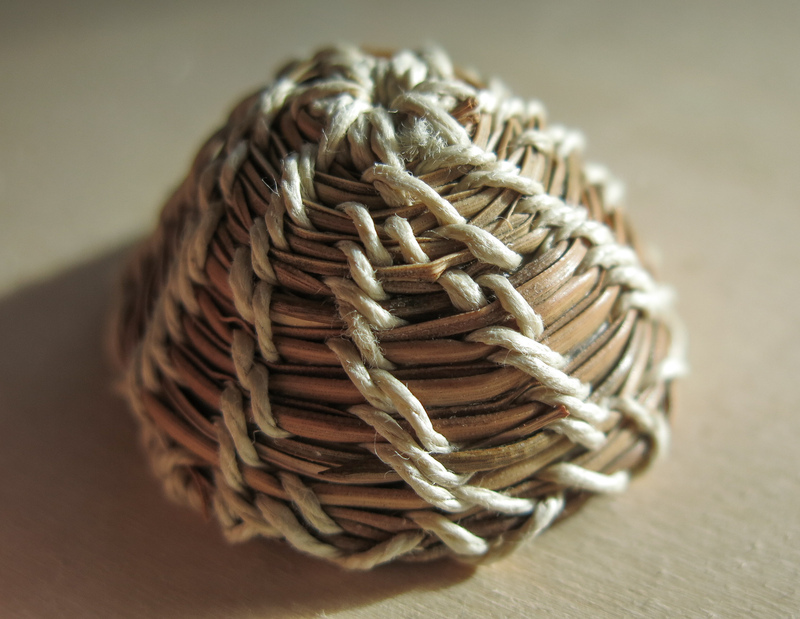 Beads were used to make this amazing little basket! It is a little cube only an inch on each side and the lid actually comes off! It was made by Sheralee Mack, who comes from the Gitxsan First Nation. 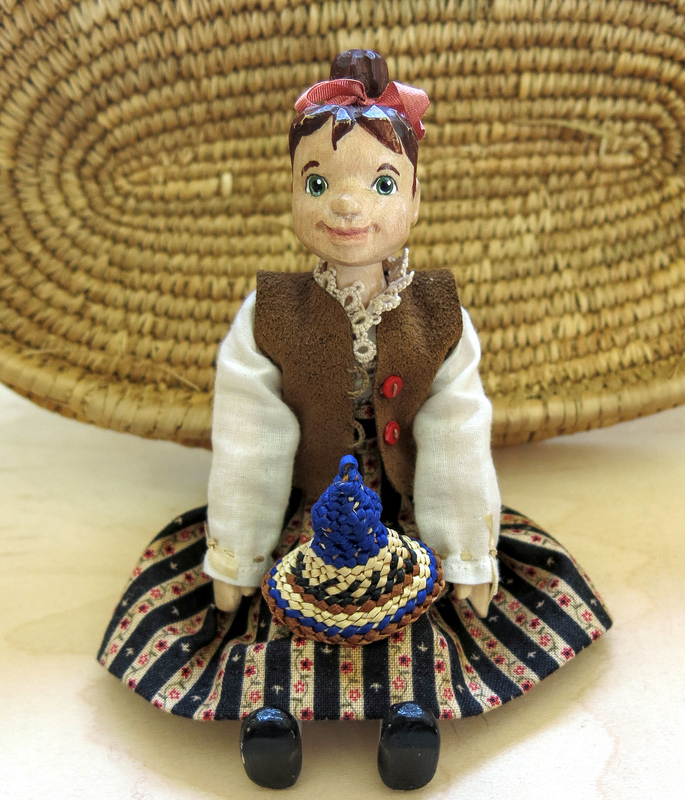 Constance’s Berry basket reminds her that berry season will soon come…the birch bark basket was made by Finnish weaver G. Lottanen. 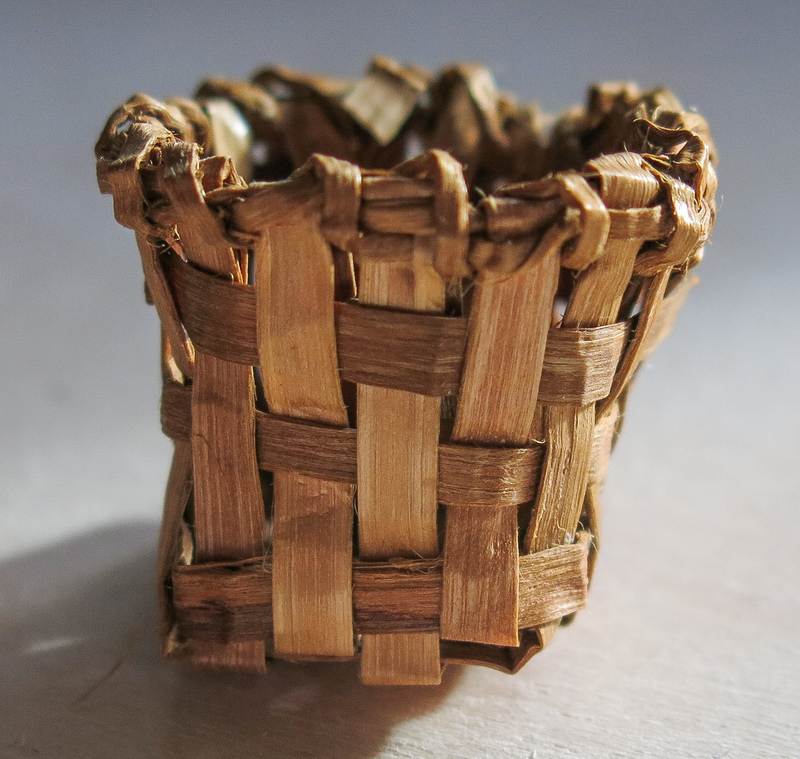 This wee basket was made by a Hitty friend who was practising pine-needle basket-making. It was photographed upside-down so the nice slanted stitching is visible. 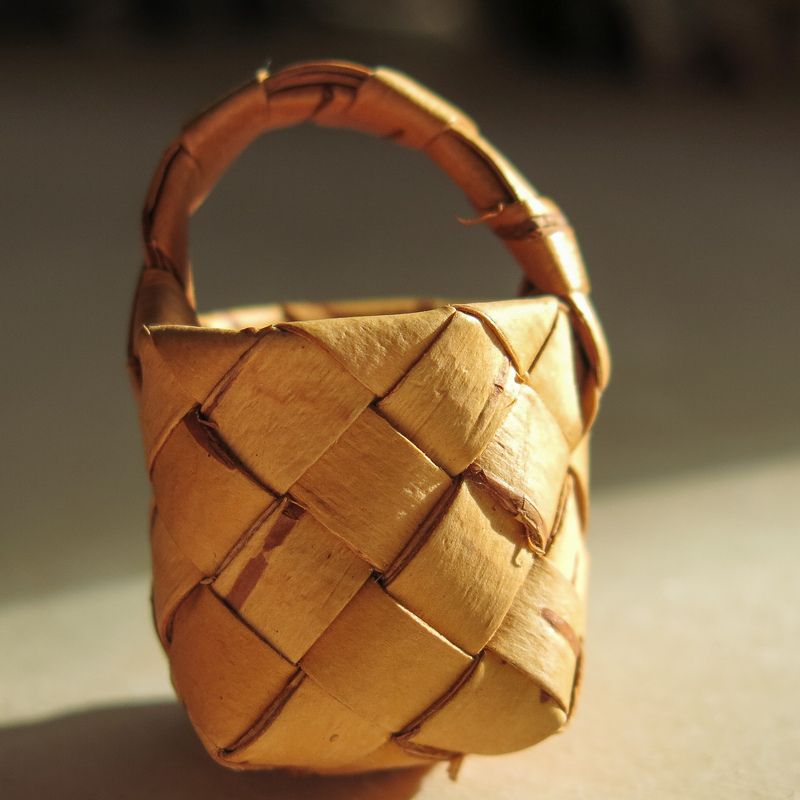 The little Cedar Bark berry basket in a Northwest Coast style was made by the Quimper Hitty human during a class taught by Coast Salish Weaver Jessica Casey. 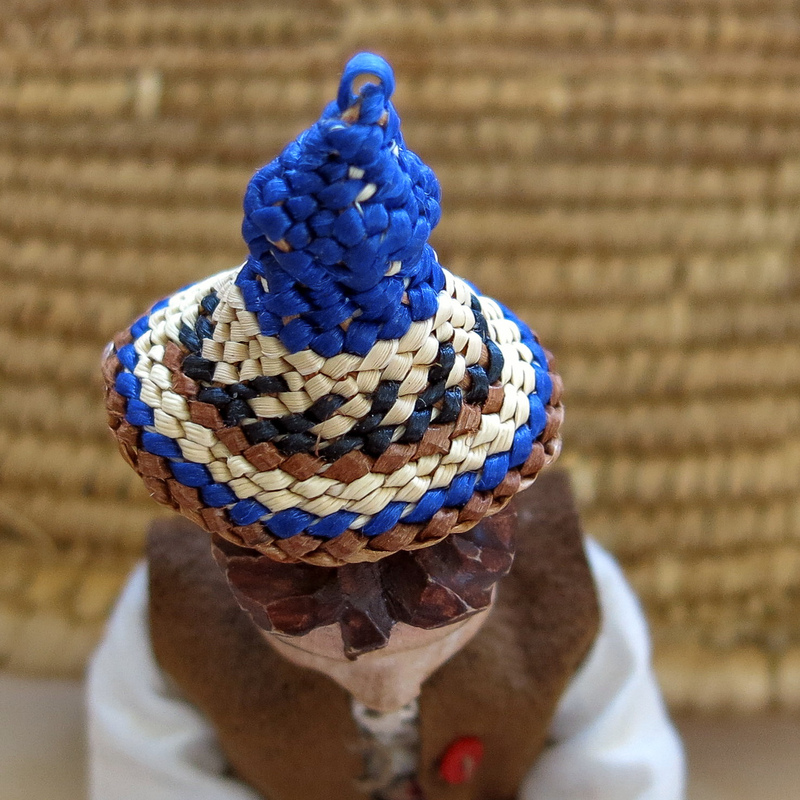 This tiny hat was made by Nuu-chah-nuulth weaver Julia Joseph. It is made using grass over Cedar Bark, similar to the Makah whale baskets, and the design on this tiny hat shows a whaling canoe! The hat is a typical shape for a Chief’s Whaling Hat, and not usually worn by a girl with or without a topknot. The QHs are very lucky to have a human with an eye for tiny baskets! And a way with the camera. 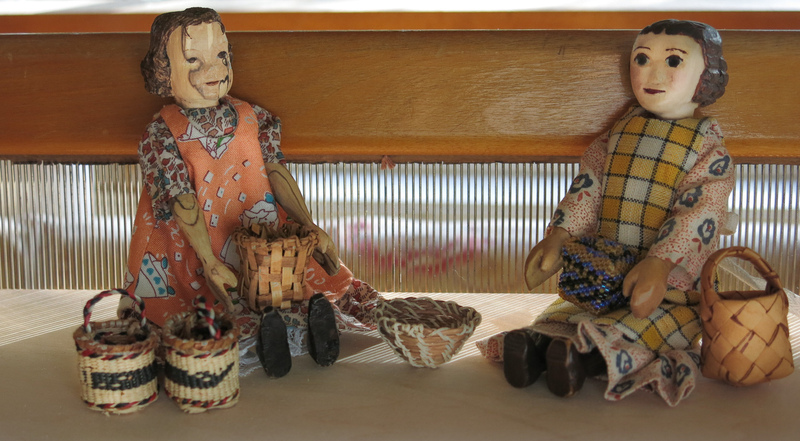 Thank you…we love basket-weaving, and enjoy learning to use techniques and materials. Your baskets are truly wonderful! They are! We love them all! Oh wow, the Quimper Hittys are very lucky to have such a wonderful selection of baskets for every need imagined. They are all gorgeous and it was interesting reading about them. Hmmm…I am thinking that the Rose Cottage Hittys will be starting to think they are seriously lacking! There are some very beautiful English Willow baskets! 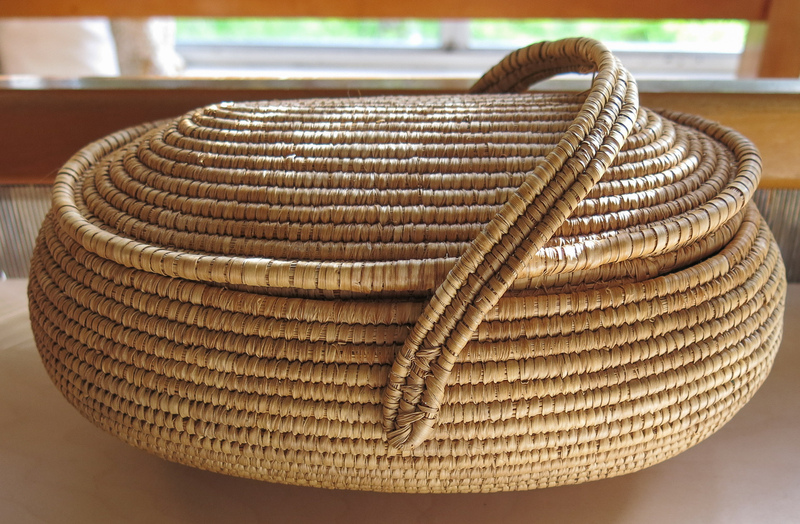 I think the Rose Cottage Hittys should definitely go basket-hunting…The whale baskets were being sold as Earrings, the Nuu-chah-nulth hat and the Finnish Berry basket were being sold as key-chains…keep your eyes open! Fascinating and thoroughly enjoyable. It seemed to me that Eugenia had a bigger smile than usual on her unique little face. Thank you for sharing such rustic beauty with us. Well this post certainly started something with the Country Hittys…first they all scurried off to round up all the baskets in the place and then pointed out to me how LACKING in variety they were. Soooo guess I will be on the lookout for earrings, key rings and assorted other basket sources. Great pics and wonderful descriptions. Thanks!! Baskets just find their way into our house somehow! 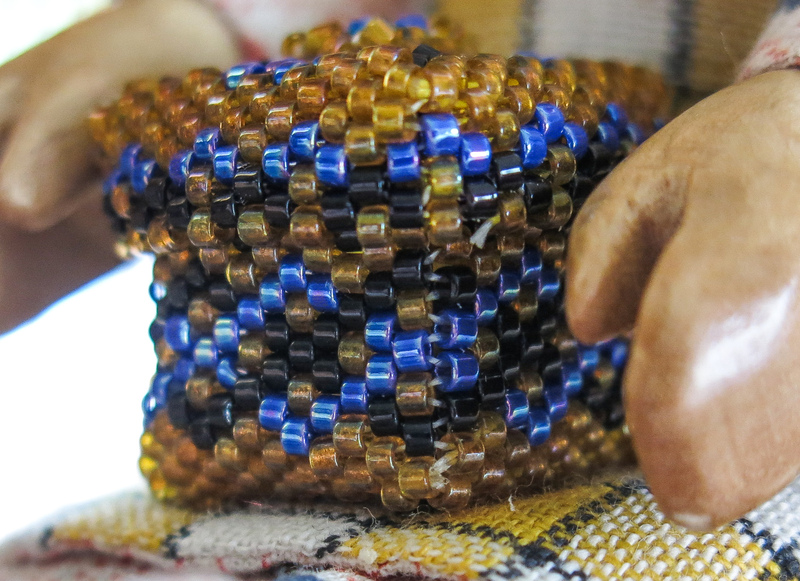 We think they are so ingenious, and love to see things made by hand. Hitty Noel and Hitty Madison just pointed out that we are living in the midst of Ozark Hickory splint basket making country and they need some examples of this. Guess I better get cracking! We have always loved baskets big and small – the big basket was in Super Chance in James Bay, the little Whale basket earrings were from a bead shop in Port Angeles, the beadwork basket was purchased from the artist on Inner Harbour Causeway a few years ago, and the wee hat was bought from the artist on the Nanaimo-Horseshoe Bay Ferry!